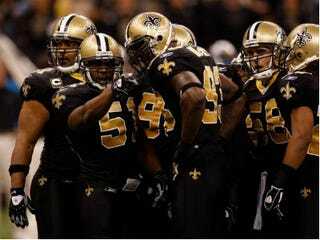 The NFL came down hard on the New Orleans Saints for their illegal bounty program, suspending coach Sean Peyton for the upcoming season, fining the team $500,000 and snatching two second-round draft picks. The league is weighing the penalties for players such as Saints linebacker Jonathan Vilma, who reportedly offered $10,000 to any teammate who knocked Brett Favre out of the NFC Championship Game in 2010. "Discipline for individual players involved in the Saints' prohibited program continues to be under review with the NFL Players Association and will be addressed by Commissioner Goodell at a later date," the league said in a statement. "The program included 'bounty' payments for 'knock-outs' and 'cart-offs,' plays on which an opposing player was forced to leave the game. At times, the bounties even targeted specific players by name." In addition to Favre, according to the NFL's investigation, quarterbacks Cam Newton, Aaron Rodgers and Kurt Warner also were targeted by name. I suppose that those men and their families are thankful for the whistleblowers in "Bountygate." I imagine that other opposing players and their families are grateful for the informants who came forward. I suspect that Saints players and their families would feel likewise if sources had exposed the scandal on another team. Anyone who cares about the life and limbs of targeted players is thankful for the "snitches" — not that the derogatory term is appropriate or appreciated. Unless you're a proponent of criminal activity, gangster ethics and witness intimidation, the word has no business in your vocabulary. NFL Network analyst Warren Sapp and NBA analyst Charles Barkley don't get it. Both men complained that whoever shared information with league was out of order. Barkley questioned the source's manhood and called him a "snitch." Sapp went further, stating that former Saints player Jeremy Shockey was the "snitch," which led Shockey to call for the broadcaster's punishment. The NFL Network responded, reminding Sapp of his role and telling him to stay in his lane. We're not talking about schoolchildren tattling on who threw the spitball. We're talking about speaking up in cases of serious wrongdoing. Mark Felt did it as the source for coverage of the Watergate scandal. Daniel Ellsberg did it as the source who leaked "the Pentagon Papers." Jeffrey Wigand did it as the source who shook Big Tobacco. There's a long list of whistleblowers who acted on behalf of the greater good. Minnesota Vikings punter Chris Kluwe gets it. He went on Twitter and blistered the folks who find fault with the NFL's informants. "To everyone who thinks the source was a 'snitch' and a bad person — (expletive) you," he tweeted. "(Expletive) you and your glorification of criminality. (Expletive) you and your degradation of ethics and morality. (Expletive) you and your short-sighted, narrow-minded hypocrisy. (Expletive) you and your idiocy. Try doing the right thing for once and standing up for what's important in life — the proper treatment of your fellow man. #(expletiveexpletives)." Residents of drug-infested, crime-filled neighborhoods are all-too-familiar with the effects of demonizing truth-tellers. The philosophy of "snitches get stitches" brings out the worst in society and discourages the best. We need more defenders of righteousness in the streets and in the office, in courtrooms and boardrooms … and in locker rooms, too.